Since the announcement of Xbox One Microsoft X only talked about output native 4K on a 4K display. If you connect a FullHD screen to the console, then the device switches to the display mode at 1080p. But 4K and FullHD displays-not the only one on the market. Many gamers today prefer monitors with a resolution of 1440p. Redmond company, in turn, has expressed support for this format, so many thought that the Xbox One X just will output the picture in 1080p, even if the connected display with 1440p. Fortunately, all is not so. 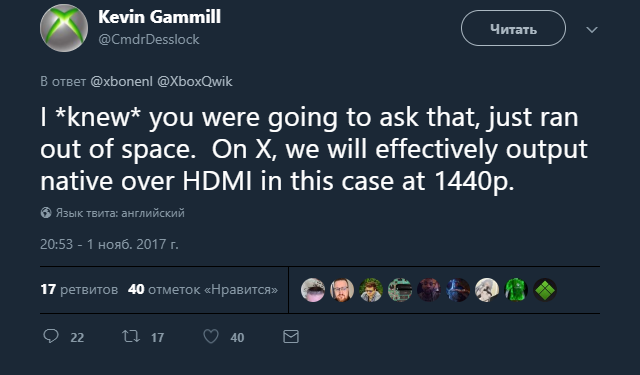 Kevin Gemmell (Kevin Gammill), program Manager of the Xbox Platform Partner Group, wrote on Twitter that the console will display an image in 1440p resolution, if it determines appropriate monitor. Xbox One X is scheduled for 7 November 2017. The most powerful console on the market is equipped with 12 GB of GDDR5 memory, modified OCTA-core AMD Jaguar processor with 2.3 GHz, and 40 computing units Radeon with a frequency of 1172 MHz. The peak GPU performance is 6 teraflops (FP32).